It has been another tough week for the Millers. We've known for a month or so that it was time for our "Little Cat That Could," Alex to leave this world. 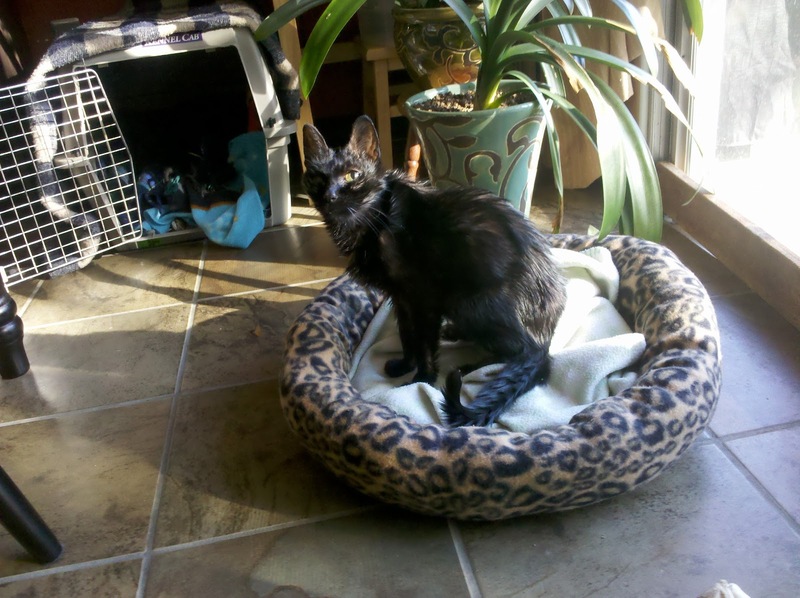 Lil' Al, as she was known after being named after Alex Rodriguez, was getting up in years (over 14) and was having increasing difficulty with the day to day activities of a house cat. It was with teary eyes that I drove back home after taking her to Kellogg Pet Medical this 16th day of July. I'm sure there will be more memories to post, but I wanted to get this one up in honor of our little cat. Lil' Al was indeed the sweetest cat and won our hearts the minute we met her scared, wet, hungry, and cold on our back doorstep when we lived on Cameron Avenue. Amy and I didn't hesitate to both agree that Al would become our 3rd pet, joining Sadie "Pretty," and Griffey. After we brought Al in and fed her, she purred like a cat 4 times her size. That first night she spent with us, she purred the entire night until the next morning. Through 3 moves, she was always the cat who wanted to be around you. She was sweet and quirky and completely lovable. Because Al was most likely malnourished and weaned prematurely, she was very undersized. So much in fact that when we had her fixed and they shaved her belly, the hair never really grew back completely. Little Al loved cheese like nothing else, and was always around when food was being prepared. Today when I prepared Gracie's lunch, which included cheese, I immediately missed our dear Lil' Al and fought back the tears. You will be missed dearly Lil' Al. We love you and will always remember you fondly. [url=http://www.redlotuscasino.com]casino[/url] http://www.redlotuscasino.com casino Remember, before you visit any sites like these, check your local laws. Make sure that gambling and online gambling are allowed in your area. Even in different areas that allow online gambling, the rules may differ, so be sure to check the laws and rules thoroughly. Also, read all the terms, conditions, and rules of an online casino before signing up. Thanks for reading this guide! [url=http://www.triumphcasino.com]online casino[/url] http://www.triumphcasino.com casino http://www.affrewards.com [url=http://www.affrewards.com]casino affiliate program[/url] In bingo, each player will get a sheet, which has six cards with a total of 90 numbers. [url=http://www.bingokisses.com]bingo[/url] [url=http://www.bingoeuphoria.com]bingo[/url] bingo bingo http://www.bingokisses.com http://www.bingoeuphoria.com With online bingo your cards are randomly selected by the computer and you can play with a great number of cards sometimes as many as 100 or more. Ordinarily you will need no more than three or four cards. A display board or a caller will flash your bingo numbers and you will need to fill the pattern displayed to win the game. Some online games will have the computer automatically search and fill the numbers for you. Some people find this automation a kill-joy but some actually love the fact that all they have to do watch for the bingo flash!! !